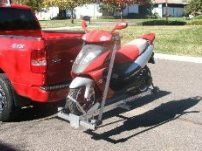 TILT-A-RACK 210ACR - Motorcycle | Scooter | Moped Carrier - FREE SHIPPING! Looking for a trailer to tow your new moped or scooter but don't want to mess with spending $3000.00 on a trailer that takes up the only space left in your garage and must be registered annually and inspected! How about a better alternative that will provide you will the abiliy to attach a trailer to your tow hitch on your truck and then store flat when not in use! Thats right an attached transport device is not considered a trailer and this means no more registration fees! You need to purchase our Tilt-A-Rack. This TILT-A-RACK is perfect for any scooter we sell on our website or in our store locally. It will also hold any 2 wheel machine uo tp 200 lbs. This rack is ideal for the mopeds we carry please click here for a list of scooters this tils-a-rack will fit. BASICS: The 210ACR weighs only 51 lbs., has a load capacity of 200 lbs with a wheel channel�that is�60" long X 6" wide. These carriers allow you to carry your Motorcycle behind the smaller space used by sports vehicles because they are very light. Click here to see the Specifications page. They are also very EASY to use. Click here to see the Assembly instructions. FASTEST GROWING ALTERNATIVE CARRIER COMPANY USA WIDE! TILT-A-RACK 410ACR - Motorcycle | Scooter | Moped Carrier - FREE SHIPPING! Looking for a trailer to tow your new dirtbike, moped, motorcycle�or scooter but don't want to mess with spending $3000.00 on a trailer that takes up the only space left in your garage and must be registered annually and inspected! How about a better alternative that will provide you will the abiliy to attach a trailer to your tow hitch on your truck and then store flat when not in use! Thats right an attached transport device is not considered a trailer and this means no more registration fees! You need to purchase our Tilt-A-Rack. This TILT-A-RACK is perfect for any scooter we sell on our website or in our store locally. It will also hold any 2 wheel machine uo tp 200 lbs. This rack is ideal for the mopeds we carry please click here for a list of scooters this tils-a-rack will fit. BASICS: The 410ACR weighs only�60 lbs., has a load capacity of 400 lbs with a wheel channel�that is�72" long X 6" wide. These carriers allow you to carry your Motorcycle behind the smaller space used by sports vehicles because they are very light. Click here to see the Specifications page. They are also very EASY to use. Click here to see the Assembly instructions. Please email shana@countyimports.com for a FREE BROCHURE.